Aubree has been racing since the age of 10 with experience in flat karts, dirt outlaw karts (125cc and 500cc), legend cars, (OOPS! Almost forgot she raced a 120cc snowmobile at age 4!) 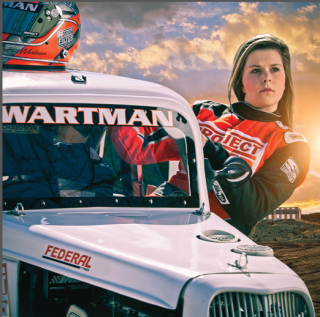 In her first two years of legend racing she was awarded the INEX Idaho State Young Lions Championship in 2012 and 2013. Aubree was raised in a smoke-free family environment and has a passion to keep kids smoke free. She has chosen to do her senior project on Idaho Code 39-5703: Tobacco possession distribution or use by minors.She thinks it’s awful what tobacco companies and sellers will do to attract a smoker. Aubree will graduate from Mountain View High School in Spring of 2015. Outside of her involvement with Project Filter and racing, Aubree enjoys snowmobiling, boating and dancing.